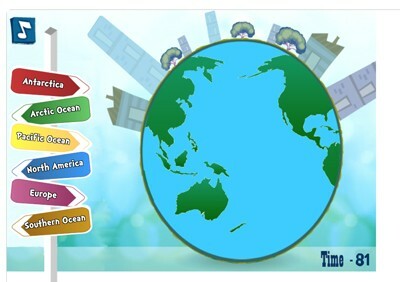 Description: This fun online game requires students to drag and drop the labels for the seven continents and the five oceans while the Earth is spinning. It is LOTS of fun, however, the game is very particular about where the labels are dropped. Description: In International Pizza Delivery, users must delivery pizzas to all corners of the world using their latitude and longitude skills. The object is to delivery as many pizzas as possible in three minutes. For each successful delivery, the user earns the flag of the nation in which the pizza was delivered to. These flags may be printed out at the end of the game. Description: This is embedded YouTube video that shows how to play International Pizza Delivery. 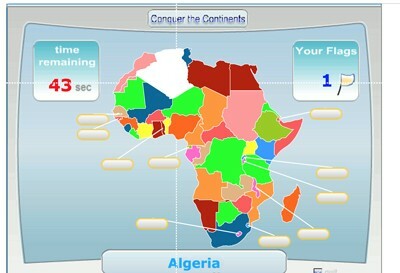 Description: This awesome game is great for TEACHING latitude and longitude and world geography. In Coordinates, students learn latitude and longitude while learning the locations and names of the world’s nations. 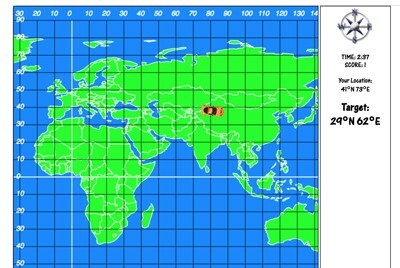 First, students are prompted to find the latitude coordinate. 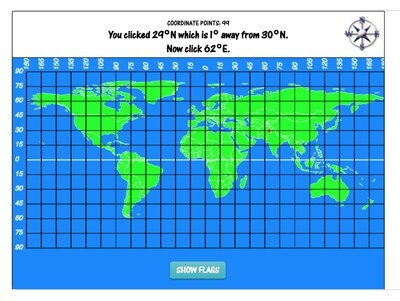 Once the latitude coordinate is found, the game locks the latitude position and the longitude lines animate into the map. 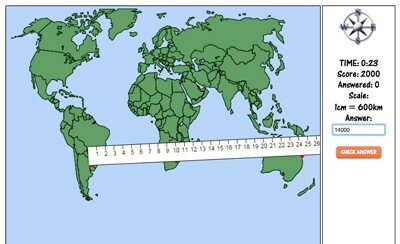 Finally, students are prompted to find a point of longitude. If the clicked coordinates are close enough to the actual coordinates that they occur in the same nation, the student will have the opportunity to “guess” the name of the nation. 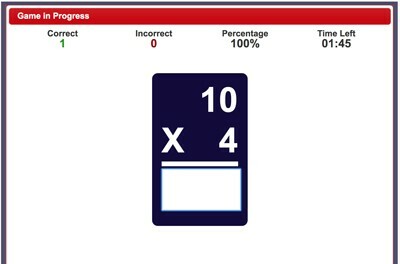 If correct, students earn the flag of the nation that appears in the flags panel. Students also have 100 “coordinate points” to work with. If the actual coordinate is 95 degrees west and the student chooses 90 degrees, he or she will lose five coordinate points reducing the total, for example, to 95. The game ends when the student has no coordinate points left. Description: This is an embedded YouTube video that will show you how to play Coordinates. 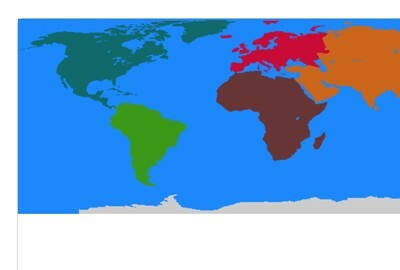 Description: This is an incredible map of the world that allows students to explore an interactive map of the world, or, play games testing their knowledge of the nations or waterways of the world. Works on all devices! Description: This fun online game reinforces the concept of map scale by challenging students to determine the distances between major world cities. Description: This innovative USA Activity allows students to construct the United States by dragging and dropping the states to the map. States are illustrated with themes relative to each state. 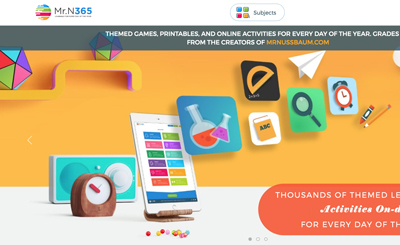 Students can choose from three different themes for each state, thereby making each "collage" different. 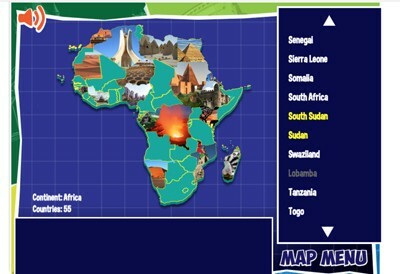 Description: This awesome resource allows students to make online collages featuring a continent of choice and its nations. Great world geography practice and collages print beautifully! 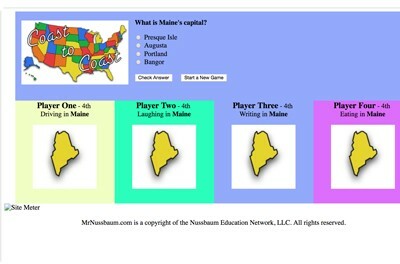 Description: This fun United States game requires students to "guess" the state the computer is "thinking" of by asking it questions about its location and its color. Students get six questions. Description: In World Detective, students select a continent and the "game" selects a secret country within the chosen continent. 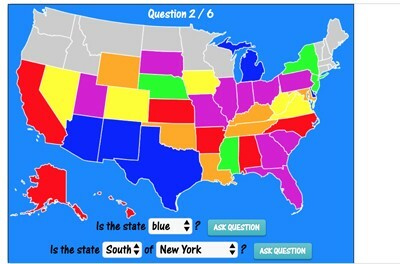 The player has six questions to try to guess the selected state. 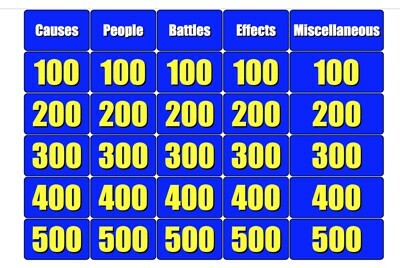 Users must generate "good" questions that allow them to eliminate as many incorrect states as they can per question. 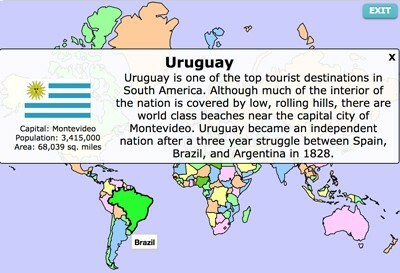 Students can ask questions regarding color or relative location. States that are eliminated are grayed out. For example, a good first question might be "is the country east of Germany?" If the answer were to be yes, all of the countries west of Germany would then be greyed out. Description: This innovative game requires students to "purchase" as many of the world's most important landmarks as possible with ten billion dollars. 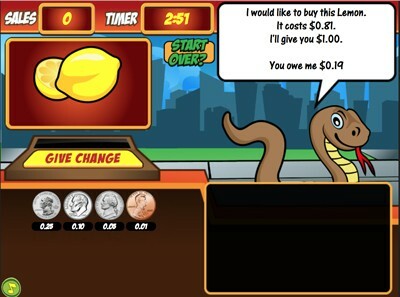 Students must purchase by using the game's tools to convert dollars to the native currency. For example, to buy the Eiffel tower, players must convert dollars to euros. 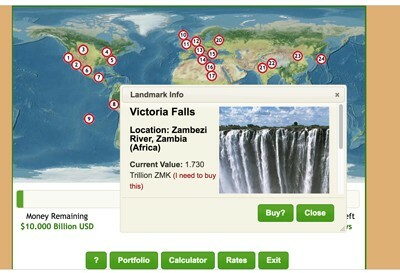 The game provides real-time currency exchange rates and has numerous twists and turns. Games can be saved! For more detailed video instructions, check out the Burnside Billion's instructional video. 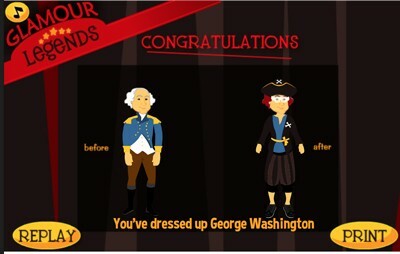 Description: This fun game allows students to dress up George Washington, Abraham Lincoln, Benjamin Franklin, Harriet Tubman, or Christopher Columbus in more modern, or more primitive clothes. Description: In this game, an "Ameriquake" occurs resulting in the state name becoming jumbled. Students must drag and drop the correct names back to their states. 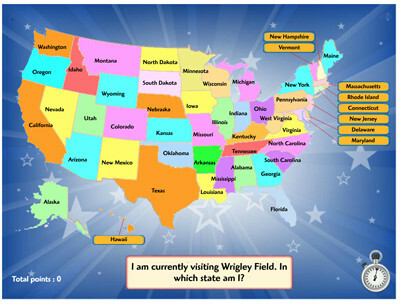 Students can customize the number of state names that become jumbled. 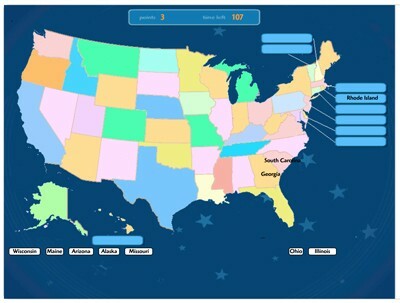 Description: This fun game challenges students to identify as many states as possible in 60 seconds. 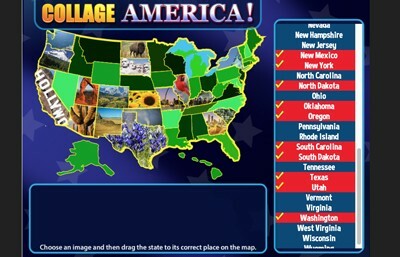 Description: This game challenges students to identify the state locations of as many USA Landmarks, Capitals, or Cities as possible in two minutes. Students can choose from the three aforementioned categories. 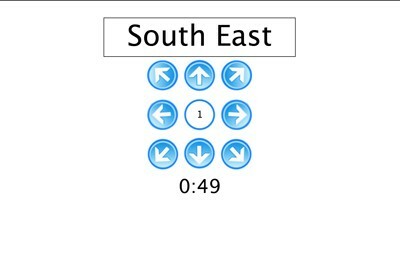 Description: Choose from three different skill levels (left/right, north/east, west, south, or combinations) and see how many commands you can successfully follow in one minute. 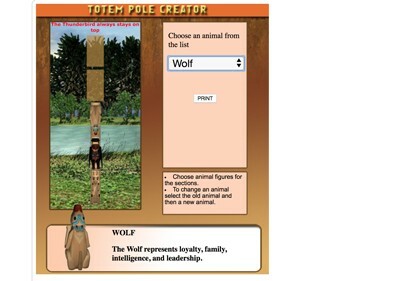 Description: This fun activity allows students to make their own totem poles with associated meanings. Each totem pole has five symbols. These print out beautifully with the totem pole and symbolism descriptions. These take students less than five minutes to complete. 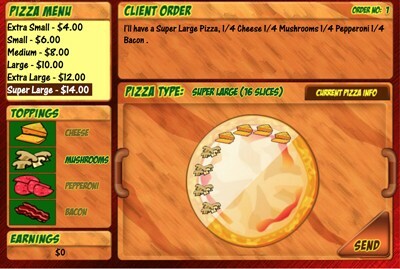 Description: In this fast-paced game students play the role of a pizza delivery person. The goal is to deliver as many pizzas as possible in five minutes to the specified addresses in the city grid. Be careful! Driving through red lights and crashing into cars results in fines. 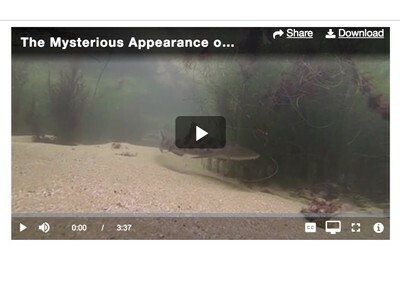 Watch the demonstration video for more information. Description: This embedded YouTube video will show you how to play News City Pizza. 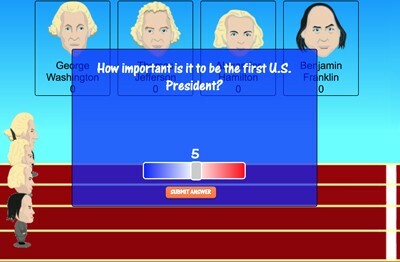 Description: Modeled after the 1970s game show, TIC TAC Dough requires students to get 1,000 points, or, score "tic" and "tac" by choose a panel between 1-9 and answering multiple choice questions about the presidents. Behind each panel is a number panel, the word "tic", the word "tac" or the dreaded dragon. 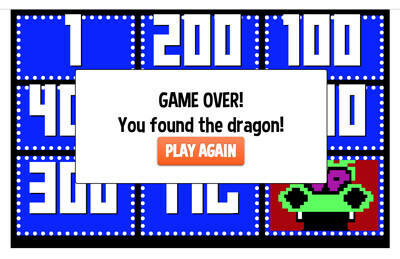 If a student picks the panel with the dragon, the game is automatically over - just like the real gameshow. 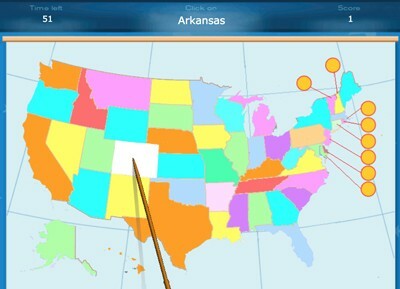 Description: This games challenges students to make a road trip across America by answering trivia questions about the states they pass through. Perfect for students interested in geography bees. Description: How many nations can you identify from the chosen continent in 60 seconds?